I only eat hard-boiled eggs, but I’ve always loved the dishes and the style of eating soft-cooked eggs still in the shell while they are cradled in an egg cup. I periodically think about getting some nice egg cups and setting my peeled hard-boiled egg in one while I eat breakfast. But I’m going off on a tangent… I really wanted to tell you about how you can easily crack and remove the top of the shell if you do eat soft-boiled eggs in the shell from an egg cup. 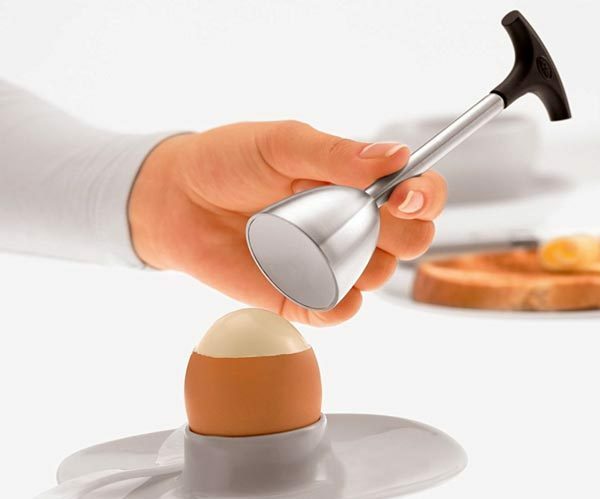 Instead of using your knife and tapping around the egg’s shell to crack and remove the top, you can just use the Rösle Stainless Steel Egg Topper with Silicone Handle to remove it with one movement. Just set the Rösle over the top of the egg, pull back the handle and release. The spring mechanism causes vibrations, and the sharp edge in the dome perfectly cuts the shell, so you can just lift it away. It works to open both soft- and hard-boiled eggs. The Rösle Stainless Steel Egg Topper with Silicone Handle is $16.95 at Amazon.